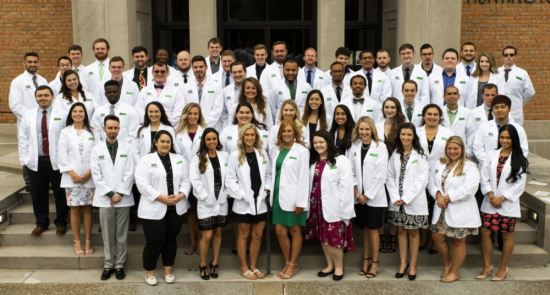 HUNTINGTON, W.Va.—The Marshall University School of Pharmacy hosted its seventh annual White Coat Ceremony Friday, Aug. 17, at the Huntington Museum of Art, during which 55 incoming pharmacy students were presented with white coats. The Class of 2022 includes 19 Marshall undergraduate alumni. Fifty-five percent of the students are in-state, and the average student age is 23. This class also includes a husband and wife, Jacob and Melba Vargas. Both are Putnam County natives. This year’s keynote speaker was William H. Riffee, Ph.D. A West Virginia native, Riffee received his Bachelor of Science in pharmacy from West Virginia University in Morgantown, West Virginia, in 1967. 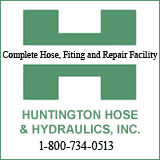 He later completed his doctoral degree at The Ohio State University in Columbus, Ohio. He spent the next nearly 40 years of his career in teaching, researching and administrative roles in pharmacy education. Before retiring in 2013, he served as the dean of the College of Pharmacy at the University of Florida in Gainesville, Florida. During his tenure of 17 years, the college developed Pharm.D. program distance learning opportunities and continually ranked in the top tier of pharmacy schools in the nation. During the ceremony a number of scholarship recipients were recognized. Caleb Miller was awarded the $9500 Gateway Scholarship. The Gateway Scholarship is a distinct honor, bestowed to a non-resident student each academic year who exemplifies the work ethic and determination necessary to succeed in the classroom and the pharmacy profession. Justin Mays and Elijah Piatt received the $2500 Stephen J. Kopp Excellence Award. To receive this award, students must meet two of the following four criteria: resident of either West Virginia, Ohio or Kentucky, grade point average (GPA) equal or greater than 3.75, Pharmacy College Admission Test (PCAT) score greater than 85 and school of pharmacy interview score in the top 10% of the class. Breanna Lamb and Jordan Merritt received the $2500 Don Perdue Award. Evaluations are based on a GPA in the top 20% of their class, PCAT score of 70 or greater and school of pharmacy interview scores. Saul Garcia received a $2500 diversity scholarship from Marshall University. Faith Fowler and Ricky Moore were awarded $2000 scholarships from the school of pharmacy. Recipients must have a GPA greater than 2.5, meet Free Application for Federal Student Aid (FAFSA) criteria and submit an essay on how the scholarship will affect their education and family. Kayla Wisely received the $1500 Advantage Toyota Scholarship, which is awarded to a resident of Cabell, Wayne, Putnam, Lincoln or Mason County with demonstrated financial need. Arianna Davis received the $1000 Jerry and Margaret Hodge School of Pharmacy Scholarship, which is awarded based on financial need. The Marshall University School of Pharmacy opened in 2012 and graduated its first class in 2016.